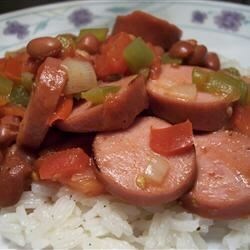 "This is an easy and delicious take on a Louisiana classic that you can prepare and cook in 40 minutes! I use turkey kielbasa to cut down on the fat, but not the flavor. Season with hot pepper sauce if you like." In a large skillet over low heat, cook sausage for 5 minutes. Stir in onion, green pepper and garlic; saute until tender. Pour in beans and tomatoes with juice. Season with oregano, salt and pepper. Simmer uncovered for 20 minutes. Serve over rice. Get set for some serious Cajun flavor! I thought this was very good and super easy to make. I did add some cajun seasoning but the spicy cajun sausage I used provided plenty of "kick." We'll definitely make this again.